Doctors is a romance medical drama that follows neurosurgeon Yoo Hye Jung (Park Shin Hye), and her quest for justice after her grandmother passes away. With a scarred past and her compassion as a doctor, Hye Jung makes for an interesting character. And this in turn, makes for an interesting drama. 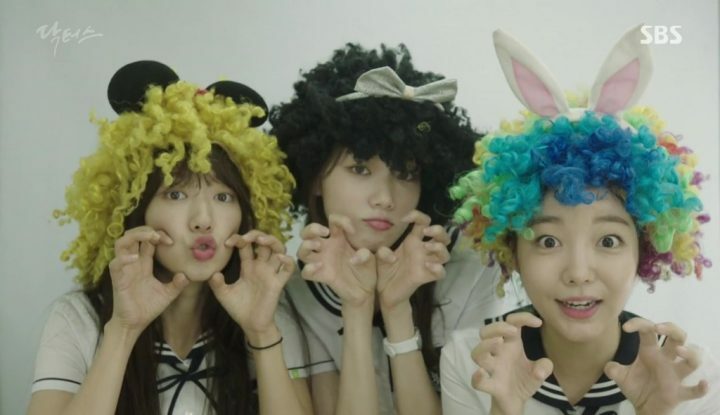 If you’re worried about it being too heavy-handed on the melodrama, Doctors has plenty of carefree moments to balances out the more serious mood at times. Along with the mature portrayal of relationships, its top-notch cast and authentic writing all make Doctors a drama not to be missed. The first three episodes of Doctors establishes the past and introduces us to our heroine Hye Jung’s not-so-smooth life. She was taken in and raised by her grandmother after her father abandoned her. Even though she has no desire to go to school, she quickly changes for the better and didn’t let the unfortunately events beat her down in life. Thus far, I’m already in love with her no-nonsense, tough character. The cherry on top is that Park Shin Hye’s detailed acting really makes this character her own in a believable way. We also meet our hero Hong Ji Hong (Kim Rae Won), a hardworking former doctor and caring teacher to Hye Jung. He’s friends with Hye Jung’s grandmother and lives right behind them. Though our heroes got off on the wrong foot, they quickly get over it and spend time together due to the close proximity. Ji Hong naturally grew interested in Hye Jung’s rebellious life thus far and her subsequent desire to turn a new leaf. Yet what bothered me about the drama’s writing at this point is how it portrayed Ji Hong’s romantic interest in Hye Jung. It seemed inappropriate on multiple accounts as she is still a high school student and he her teacher. I wish the drama would have waited until the two of them reunited to begin developing this attraction. Meanwhile, the smartest girl in her class, Jin Seo Woo (Lee Sung Kyung), becomes one of Hye Jung’s only friends and tutors her in schoolwork. However, when Hye Jung unexpectedly outperforms her on a test and starts spending more time with her crush Ji Hong, Seo Woo quickly turns Hye Jung into a target. Seo Woo paints herself out to be the victim after an accident, and schemes a scandal between Ji Hong and Hye Jung. Needless to say, this is only the beginnings of a rivalry that’s sure to resume in the near future. The recap of the past concludes when Hye Jung’s grandmother dies, which was the primary catalyst in her decision of becoming a doctor. Hye Jung knows that the surgeon in charge, Seo Woo’s father, botched the surgery but is refusing to tell the truth. This, coupled with her scandal at school, sends her onto the next chapter of her life in pursuit of becoming a doctor. As our cast reunites 13 years later in a hospital they all work at, Doctors kicks into high gear with its primary conflicts and storyline. Seo Woo and Hye Jung naturally become frenemies, in both love life and at work. 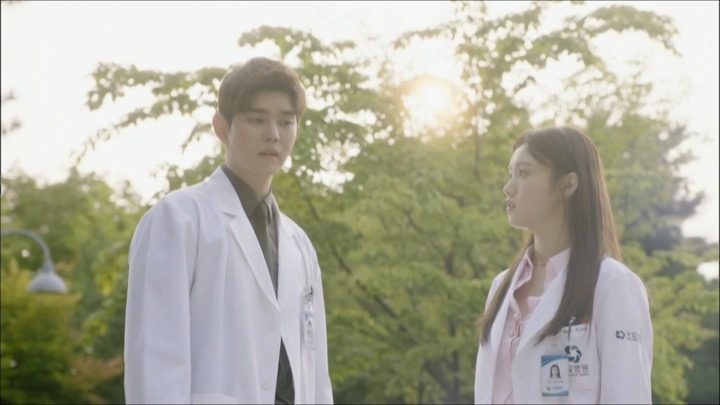 History repeats itself when we meet our second male lead, Jung Yoon Do (Yoon Kyun Sang), a hospital colleague who quickly falls for Hye Jung. And Seo Woo’s unrequited love towards Yoon Do leads her to relive her teenage years again. I find it hard to like Seo Woo at this point because she acts like the world should revolve around her and that Hye Jung is personally out to get her. Though I understand her character’s purpose as a conduit for creating conflicts and pushing the story forward, I have little sympathy towards her self-centered behaviors for the time being. I hope she matures later on to be a character that shows inner growth. Hye Jung is a breath of fresh air from Seo Woo’s drama queen tantrums. Hye Jung on the other hand, is career focused, well liked at work, and a refreshing breath of fresh air from Seo Woo’s drama queen tantrums. She came to this particular hospital to find out the truth behind her grandmother’s death. I particularly appreciate how the drama didn’t lose the details that make her so unique. She’s still tough, but more vulnerable after what she’s went through from her past. Meanwhile, Ji Hong still has lingering feelings for Hye Jung, despite not seeing her for a long time. Unlike most dramas, he’s open with his affection towards her right away. The only thing preventing them from being together is Hye Jung’s hesitation and focus on her tasks at hand. That is not to say there’s no romance in the air. Our couple shares plenty of cute moments together as Hye Jung slowly allows herself be happy and opens up to Ji Hong. This makes for a much more realistic pacing for rekindling the fire between them. Doctors has an awesome carefree vibe that I really enjoy, and a lot of humorous moments to keep me smiling on. Even beyond the engaging dynamics between our main leads, there are plenty of other characters that caught my attention and left good impressions. But as we vaguely learn about some scheme brewing with the hospital’s management, I worry that it’ll change the tone of the drama. I would rather Doctors stays lighthearted instead of being bogged down by the unnecessary subplots of the greedy pursuits of higher-ups like many other medical drama tends to. In this section of Doctors, we experience pivotal progressions, for better or for worse, in most of our character’s personas and relationships amidst the subplot of fighting over the hospital’s ownership. It disappoints me when one character is a clear superior person. Seo Woo decides that she’s going to do whatever she wants. From dressing inappropriately to slapping Yoon Do cause her of her jealousy, her character starts to greatly test my patience. She demands to know why Hye Jung came to the same hospital as her and thinks that it’s because she wants to take everything she has away from her. I don’t mind if the female leads are cat fighting, but it disappoints me when one of them (mostly the heroine) is made out to be a clear superior person. I would have preferred Seo Woo to be a lot less self-absorbed and delusional, which would also make the rivalry a whole lot more interesting to watch. On the romance front, Hye Jung and Ji Hong finally take their relationship to the next level. Hye Jung is still a tough gal with rough edges both physically and mentally, but begins to allow herself to be softer around those she likes. This gives us a yet another perspective of her, making her a relatable, well-rounded character. These episodes of Doctors culminate towards the final reveal about Hye Jung’s grandmother’s death. But at the same time, they have a nice added touch of heartbreaking patient stories that really help sustain my interest and enthusiasm in the drama. Different patients require different approaches, which inevitably sheds more light on what types of people these characters are. These patients also put our heroes to test, challenging them to be more fearless, more compassionate, and more risk-taking as doctors. In a train of misunderstandings, an important VIP patient loses consciousness and Hye Jung ends up shouldering the blame. She gets called in for disciplinary meeting and is suspended for a month. But she manages to acquire crucial documents of her grandmother’s surgery, thus leading us into the home stretch of the drama. It’s a bit of an emotional ride as Ji Hong tries to convince Hye Jung to not let revenge consume her and move on. On one hand, I’m glad the climax is finally here, but on the other, it seems to have arrived a tad too late. Even though finding out the truth behind her grandmother’s surgery is the premise of the drama, this unassuming task did feel dragged on with too much anticipation built around it throughout the episodes. I don’t think we necessarily needed all twenty episodes when the normal sixteen could have sufficed. Besides Hye Jung’s breakthrough on her life goal, Seo Woo also gets a mini-improvement on her character. Beyond her usual self-important and cynical nature, she does show a hint of maturity and compassion when she agrees that her father’s taking things too far to get Hye Jung fired from the hospital. 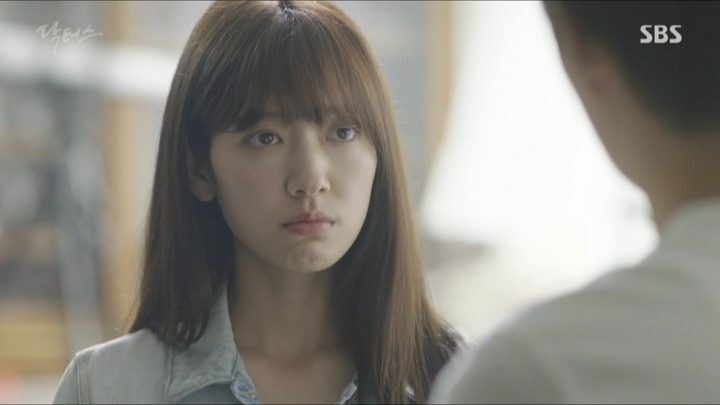 Will she continue to evolve as a character and how’s Hye Jung going to resolve her grudge? I’m hoping for some good answers in the remaining episodes. Like most Korean dramas, the ending of Doctors is nothing short of happy resolutions in a predictable way. Karma gets the best of the evil doers and everyone else ends up in a better place after their long journies throughout the drama. Doctors sufficiently wraps up its general plot and ties up any outstanding characters’ relationships. Even Seo Woo becomes mature enough to make amends with Hye Jung in the end. And I’m happy to have witnessed this seemingly simple yet authentic story in its entirety.